Chandelier designed by Greene & Greene in 1907 was redesigned by H.J. Nick in 2015 for the dining room of a VIP client. This craftsman chandelier, made from solid walnut and ebony wood is custom ceiling lighting design by award winning artist H.J. Nick. This handcrafted chandelier features genuine hand cut, kiln fired stained glass made by our expert lead glass masters. 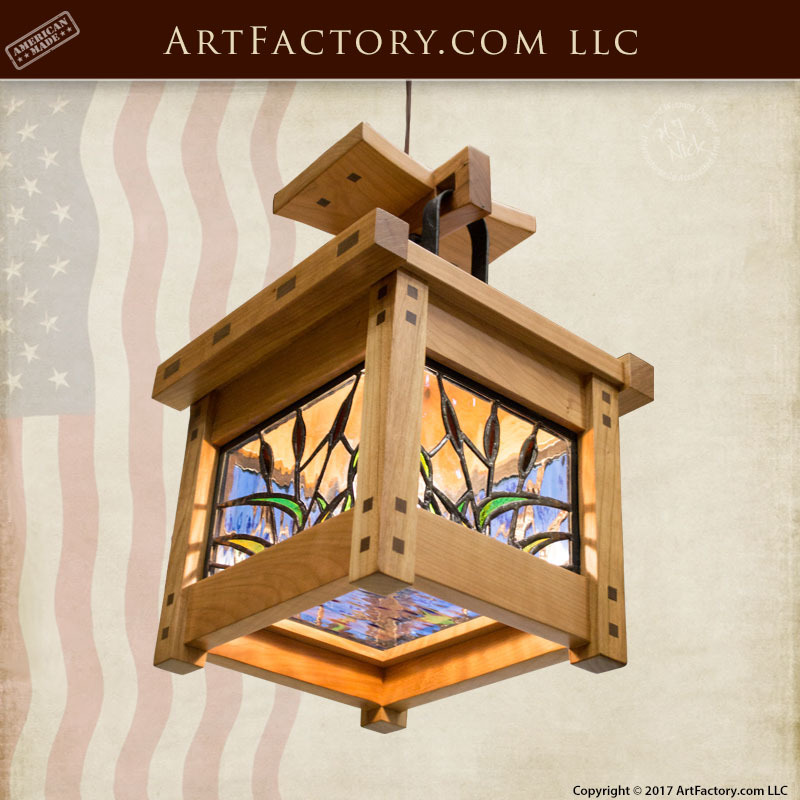 This chandelier, inspired by the Arts and Crafts movement, is an original work of art by H.J. Nick and ArtFactory.com. This craftsman chandelier is made in the same hand and materials as the original Greene & Greene chandeliers that its design was inspired by. H.J. Nick believes that using the same techniques and materials as the original is especially relevant when creating historically inspired work. It is what makes the difference between cheap, disposable, reproductions, and investment quality fine art. To top it all off, this chandelier is built to exact specifications based on the historic record. Like all of our wood products, all of our fine art custom lighting fixtures are built a from solid, full length, American hardwood. The frame that is hand hewn with mortise and tenon joinery for construction that will that the test of time. Additionally, all species of wood are available, and we offer hundreds of choices of finish color to choose from. All of our wood finishes are fine art quality, applied with a multi-step hand rubbed process, and will stand the test of time with little or no maintenance. Our master craftsmanship ensures that your custom ceiling lights will last for generations. In fact, we are so confident in our craftsmanship that we guarantee of all of products forever. Nothing from our world class factory is ever mass produced, and every item is custom made to order, based on each customer's exact specifications. Most importantly, every item is signed and certified by H.J. Nick to meet all world class fine art specifications. 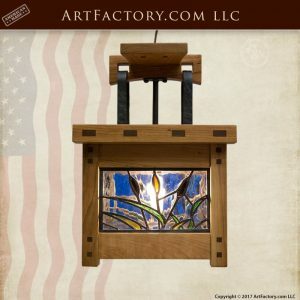 This ensures that your craftsman chandelier, or any product that you purchase from ArtFactory.com is of investment quality, and will hold future appreciable value as an antique. Call us today at 1-800-292-0008 to get a quote for the craftsman chandelier, or any of our other custom fine art quality lighting. Check out the larger version of this craftsman style chandelier (CH6126B). We work with dealers, builders, interior designers, and home owners to create custom handcrafted chandeliers, lighting, lamps, and sconces for your residential or commercial property. Our custom lighting fixtures are available in any size, style, and finish by our American craftsman, hand made using old world techniques to create a luxury fine art furnishing for your home or business. All hand crafted lighting is built using the highest quality materials and all UL listed. Order any themed lights, the choices are endless when you order your custom chandeliers and lighting from ArtFactory.com, call 1-800-292-0008. 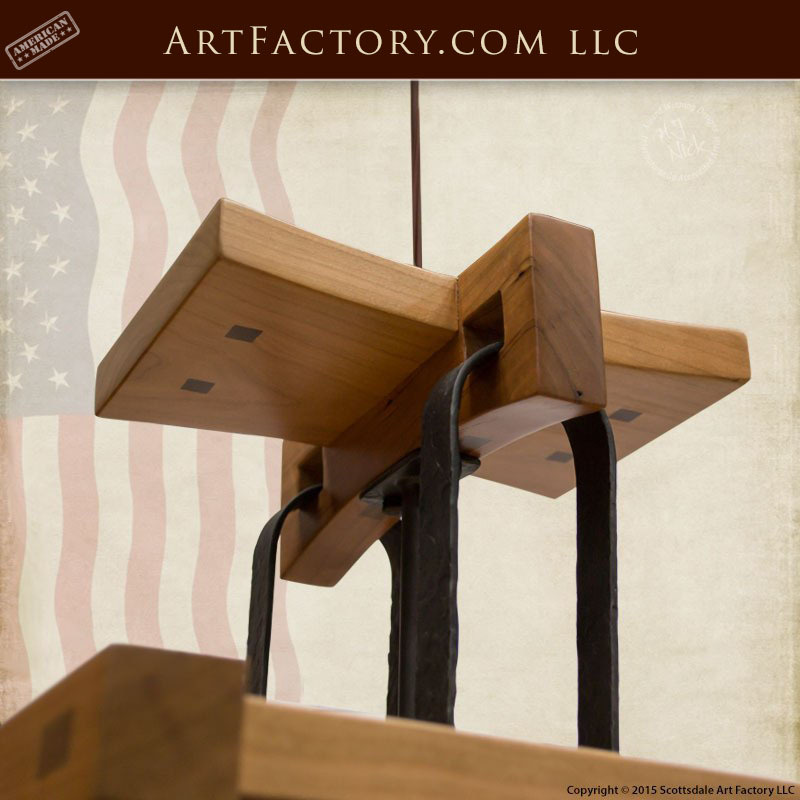 ArtFactory.com, a handmade in America custom lighting manufacturer based in Scottsdale, Arizona. Featuring designs by H. J. Nick, we have been designing and building some of the world's finest furnishings for interior designers with ordinary clients as well as more prominent and successful individuals, C.E.O.s, leaders, royalty and celebrities for over 100 years. Most of our clients want custom handmade products that have a BIG WOW factor and elegance, and all want investment value and products that make a proper statement reflecting their personality or the ambiance of the environment for which it is intended. "When Everything Made In America Was Built To Last Forever"